You could also call this lesson “emergencies” but most of the things we’d be doing were more about getting experience with landing the plane under an acceptable failure condition (e.g. loss of approach lights), rather than a genuine fully fledged emergency (e.g. engine failure). 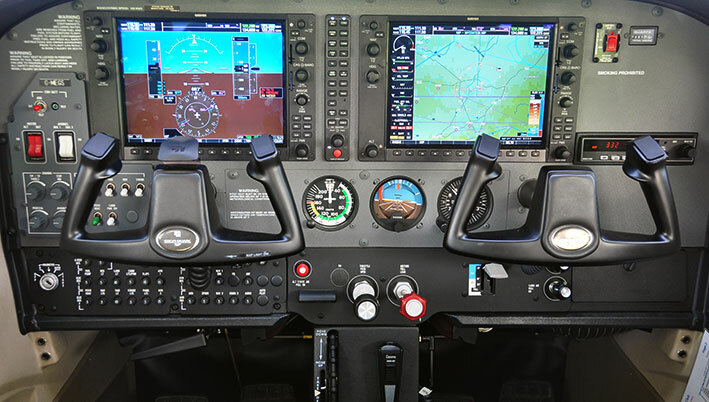 We’d go fly some circuits, the first one would be completely normal just to settle down into things (flying can be a bit like stage fright, you can do it, but in the hours before turning the key you do sometimes find yourself wondering “Can I remember how to fly?”). Landing with none of the above. My training has drilled me to check everything, even if an instructor has just landed the plane and swears it’s all good – I’ve been drilled to check it anyway, if you go on any flight safety training lecturers the old and the wise (pilots who are one, tend to be the other) they will also stress to check everything. This all sounds great in text books and it’s good safe, sensible stuff. What it also means though is that when I try to deviate or short circuit around blocks of the check list, I find it all gets into a starting up muddle. You find stupid things happen, like you jumped past the pre-startup internal checks and you’re now trying to start the plane – but wait, turning the master switch on was on the previous page, so you haven’t done that, so you have no electrics. Switches get missed, flaps get left down etc. and as you try to untangle the “must change state of” items from the “just check” items, you begin to feel surrounded by an aura of feeling like you should know how to do this……and yet you’re messing up! You’ve done it hundreds of times before, feels surreal therefore that an 80+ item checklist isn’t engraved into your memory (hmmm, strange that!). So I sort of hate doing the “lets just jump in the plane and go” approach. 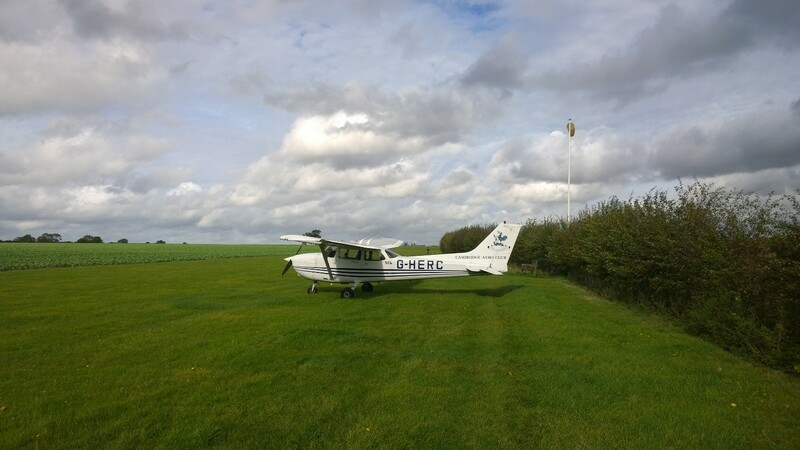 I can do it at farms & places I’ve just landed, but I can’t seem to do it when I’m getting in a plane that someone else has flown before me – I’ve found on too many occasions that the previous hirer has left the radio on approach instead of tower, or the lights set weird or the fuel selector set wrong! 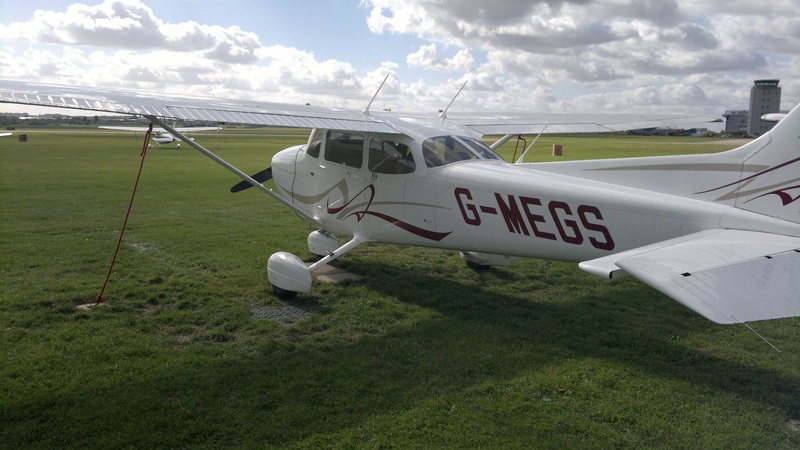 After a little bit of awkward faffing about and looking like a student all over again, the engine was running, ATC had cleared me to taxi out and we were away – the nerves could begin to calm down now. The wind at night is a strange thing, it can seem like the calmest day and then you get up 1,000ft and find it’s 20 knots crosswind to the runway. 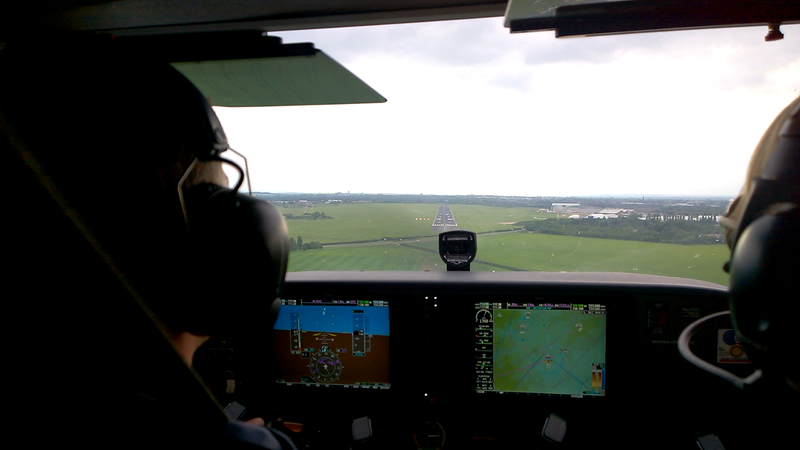 On my first circuit I turned downwind and was quickly finding myself getting pushed more and more towards the runway. 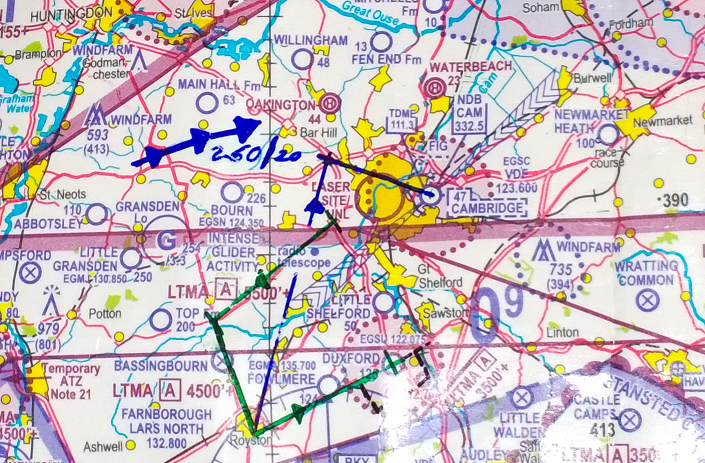 There’s a good roundabout reference at the end of the downwind leg which is an excellent guide for both ensuring you fly a sensible sized circuit and going just beyond it, a good turn point for turning base. 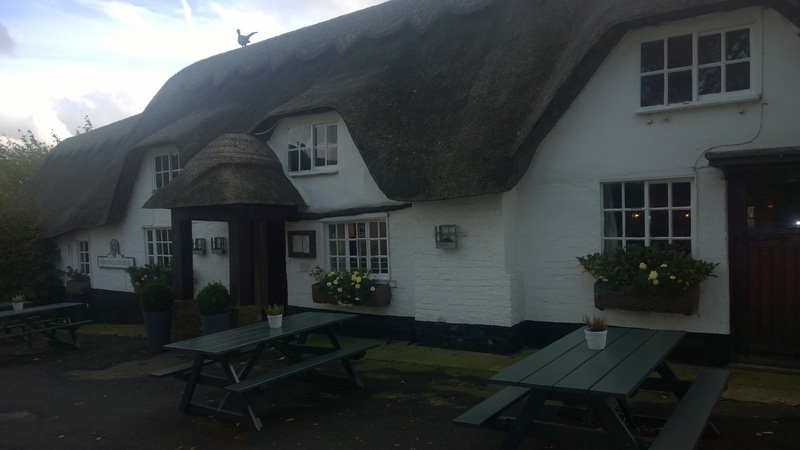 I found that by the time I got there I was left of it, meaning my circuit was tight and the wind was pushing me in – no surprise then that when I turned left on to base leg, the crosswind became a tailwind and made matters worse. I could lose the height ok, though my groundspeed was feeling pretty rapid in which to do so, but I found I had to turn on to final approach sharpish and while still trying to lose the height. If you do all this to close together your nice rectangular circuit pattern starts to look like a military style continuous turn. That’s ok, but I’d overshot the centre line of the runway and had to correct it to get it all lined up on final. Other then the overshoot, the height was good, the speed was good and everything came together in the end for a nice enough landing. What the PAPI’s give you are a visual guide on your height, you want 2 red and 2 white, this means you’re on an approach angle of 3 degrees, keep the PAPI’s looking like this all the way down and they’ll guide you gently in over the runway at a nice casual approach. More red then white equals low, more white then red equals too high. One interesting point, typically GA aircraft in daylight don’t do 3 degree landings, they tend to do 3 white, 2 red and come in at a steeper approach angle then a jet would. At night though, 3 degrees is what I’ve been told to fly. 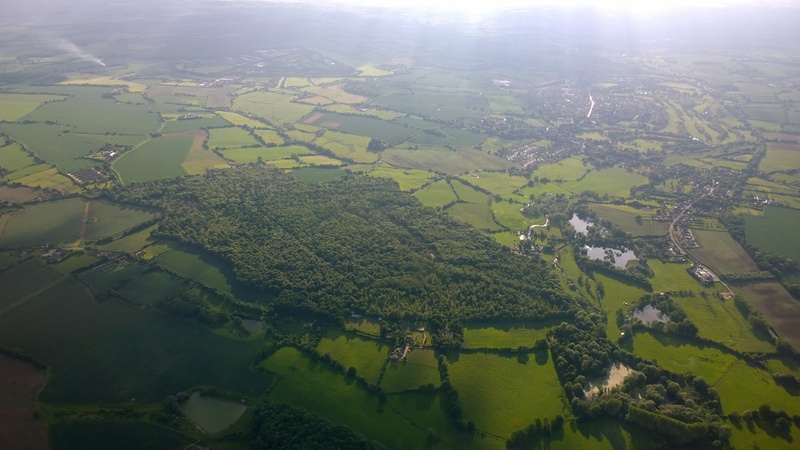 Farms, Farms and Farms……..I love farm strip flying, I can’t encourage you enough to get an instructor to teach you how to do it and then go get some practice doing it. 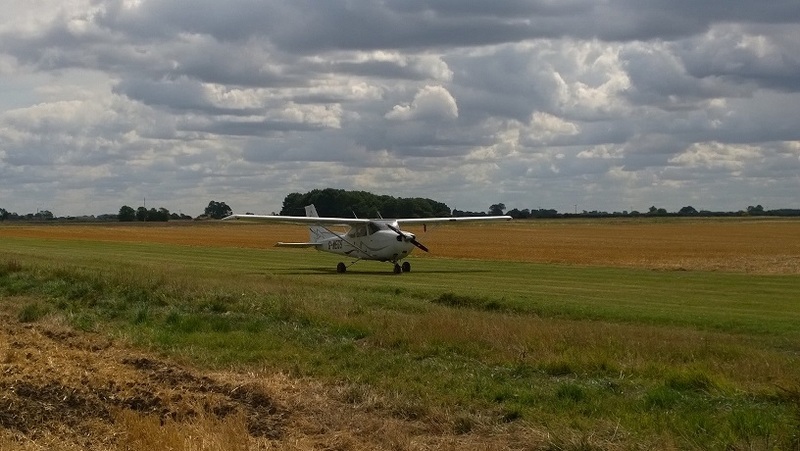 My landings got better when I started farm strip flying, nothing I’ve done has improved my landings more. So without the PAPI’s, there’s a pretty simple way to ignore all that text book stuff about runway perspective or trying to lean on your local knowledge of what the runway looked like the last 20 times you circuited on it etc. Remember that the book says “Constant bearing, constant danger”, well the same rule applies to landings: If you keep a point (e.g. 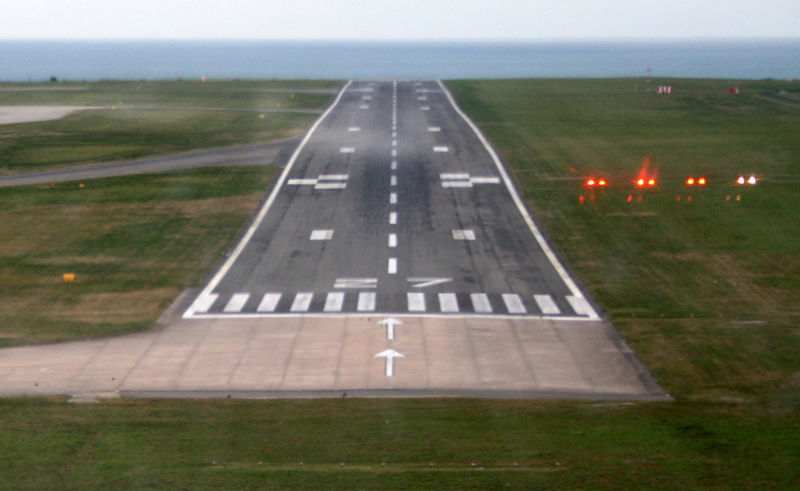 the runway threshold lights) held constant at a position in the window all the way down – you will/can land there! Of course if you have too much speed on at that point you’ll go into ground effect and float for another 150m but that’s your airspeed control going to hell, you’ll still be given every possible opportunity to flare it and make a good landing on the runway. PAPI’s or no PAPI’s. All you need to focus on therefore is that you want your airspeed in check around the same time as your landing point out of the window begins to stabalise its position. Once you’re doing 65 knots, with the runway threshold held constant out of the window, your approach angle is going to be about right. I found myself again getting blown in like crazy, again overshooting on the turn on to final. However, the lack of PAPI’s really didn’t come as any bother at all. I found I made a whole bunch more minor adjustments on the throttle and elevator as I point and powered my way to the landing point, but it was still a pretty well controlled landing. This is stranger to fly then not having the PAPI’s, there’s something quite welcoming about the approach lights leading you to the runway. Still you have the A14 and A1303 as visual references and the green strip of threshold lights at the near end of the runway. So the main thing the loss of the approach lights does is make the runway/airport feel much, much smaller. I messed this landing up a bit, as I touched down my left foot slipped and tapped the brake causing the unwanted sound of the tires to screech. The touch down speed was slow and we hadn’t landed with the brakes on but the rolling speed was too high to be touching the brakes without them making noises about it. 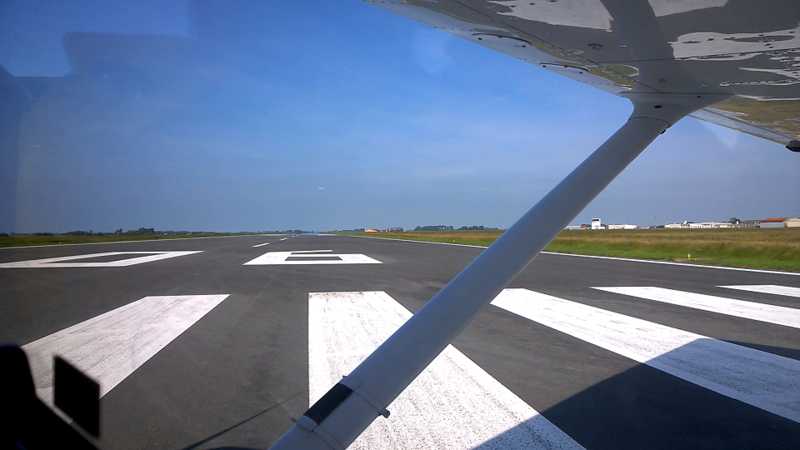 There’s a good reason that ‘feet clear of the brakes’ is on the pre-landing checklists, if you were to land with your brakes on during a skills test – you’ll very likely fail for a dangerous landing. The fear being that if you touch down at speed, brakes on, if both are on then the wheel that touches first will want to rotate the plane, or both will touch down and the tires might quickly want to give up the game. With only one brake on you’ll be at risk of flipping the plane as it rotates around the differential braking. Not a great idea. This was nothing quite so serious, but I totally accept the principle it’s a bad thing to be doing, so I wasn’t thrilled with myself on this landing. Still, you’re always able to learn from events. 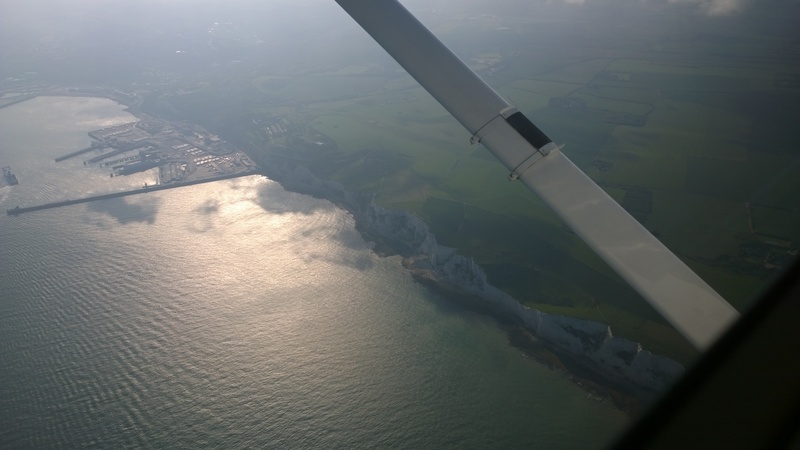 If you’ve ever seen a light aircraft come into land at night, you’d be forgiven for wondering why bother with that landing light anyway – it’s hardly illuminating anything. True until about 30ft, when it is quite effective at illuminating the runway surface, critically what it provides is depth perception. With the landing light on, those last 30-50ft before touch down can be done watching the runway come “up” to meet the plane (I know technically the plane is coming down to meet the runway, but it appears the other way around as you fly it in). So without a landing light, getting the plane down to 50ft and over the runway should be easy enough, but judging when to flare it and estimating when the main wheels will be touching down on the runway becomes tricky. Making sure my heals were on the floor and my toes were handling the rudder this time, I got it about right. I was off maybe a couple of foot on the last few feet of height in the flare so a little flat, but not bad for a first go without a landing light. 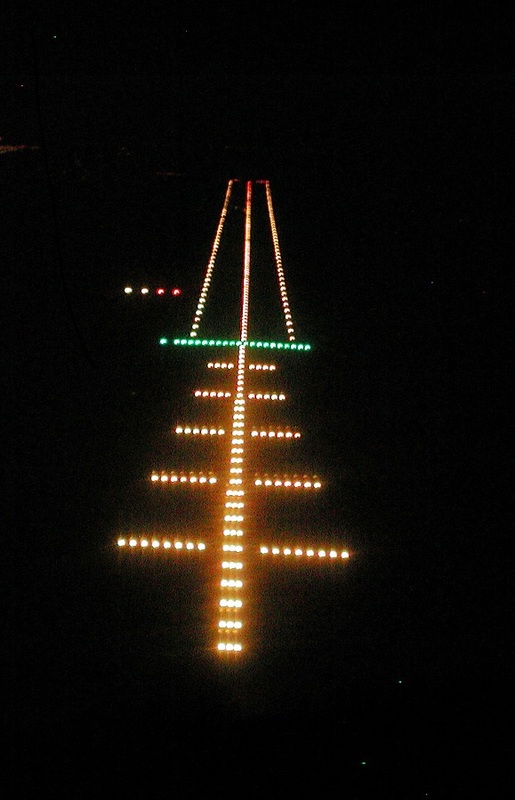 The rule is you cannot land and must go around if the runway lights fail. The reason is that without them, you’ll just be aiming for a now black centre line, somewhere in a sea of blackness. It’s really not a safe idea! Everything else is desirable, but not essential to the safe landing of a light aircraft, so time to see if I could put the plane down without any of the other lights. Getting down to the runway I found easy enough, but again the real decider on whether I could pull off a perfectly smooth landing or with a slight thump seems to be the lack of a landing light. Without it, it’s just hard to estimate those last few feet of where the main wheels are relative to the runway. Still other then the one in the middle, all my landings I’d been happy with. Again not a lot to be said really, everything seemed to up to a sufficient standard to keep progressing. The plan for the next lesson would be to get the Navigation done, before the weather really turned on us. This could be any route of my choosing as long as the flight took 1 hour and covered at least 27 nm (I can’t imagine how you do a one hour flight and fly less then 27nm to be honest, but the distance is a CAA criteria – I’m sure someone has a good rational for why there’s a distance requirement). Why get a Night Rating? Escapism: Want to escape into that childhood fantasy of getting into a bomber and taking off in search of finding a dam? Just turning a Cessna 172 on at night with a red torch in hand is fun. November – February in the UK: It’s typically damned cold at 8:30am, during my training I quite enjoyed taking a broom to an aircraft’s wings on several frosty winter mornings. However, if you’ve done it three or four times, you’ve probably done it enough. Flying later on in the day is typically warmer (but not by much). If a city looks nice during the day – it looks better at night. You might not want to do loads of night flying, but from October-Feb, a flight taking off at 2pm is going to be at risk of coming back in the dark and if you have to divert, then what? A night rating will keep it legal. What’s involved in getting one? 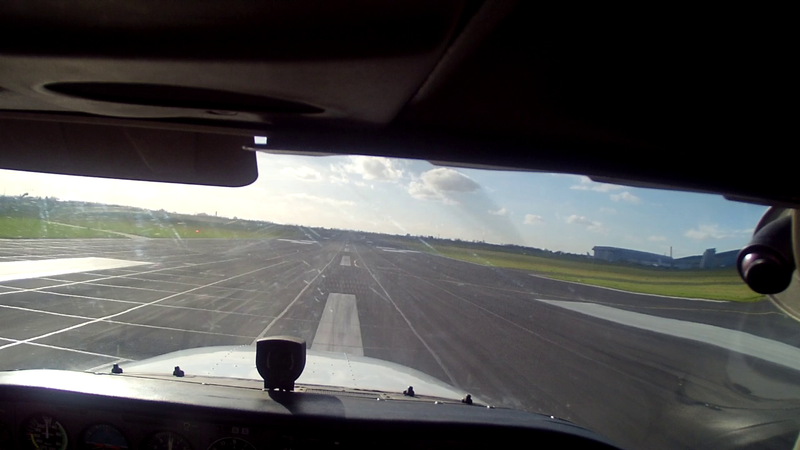 5 solo full stop landings. For more information, see the CAA website. To get used to the essentials of night flight: From airport lighting and how taxi speeds will appear very differently (out of the front window you’ll feel you’re going slow, now try looking left!). To what cities look like and gain an appreciation of just how far out you can see at night. A town you wouldn’t normally see straight after take off in the day, can be instantly visible at night – which can be disorientating. Now technically I’ve sort of done this lesson before, but that was so early into my PPL training it’d be good to repeat it. Satisfactory handling, must learn to land before continuing. That is what I’m told it says in my training record for that first night flight – gives you an idea of how long ago it was! Since then my landings have come a long way. 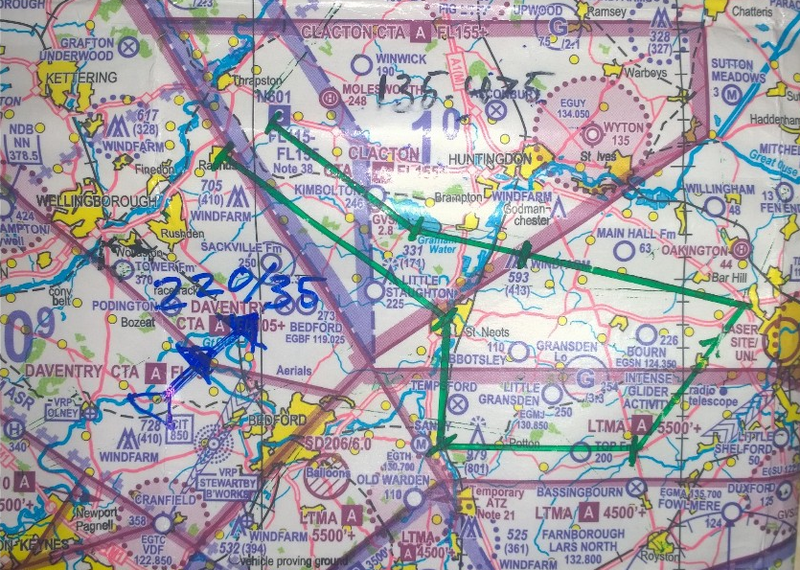 Pilots love check lists, if you don’t I’d suggest strongly that flying isn’t for you – checklists, charts, plotting routes and manual calculations are all part of the ground fun that should be an aid to building the anticipation of next going flying. Checklists in the day are one thing, at night with torch in hand, an array of instruments & switches before you. It doesn’t get much better, at least not on the ground. 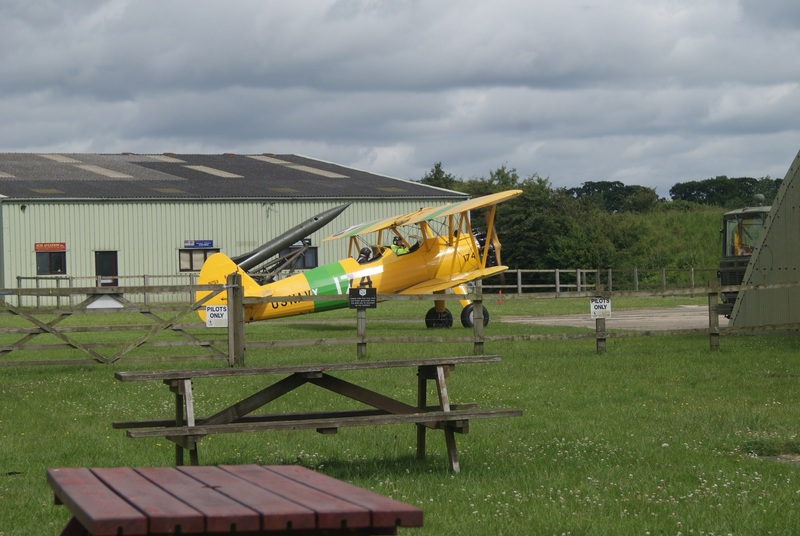 The plan was a pretty leisurely local area flight, we’d take take-off and then turn around to fly north to Newmarket. From here we’d do an orbit of the town, before heading back to the airport. Ask them for a zone transit (to allow us to fly through their aerodrome traffic zone [ATZ]), to get more familiar with the lights of the airport and when you can/can’t see them. Head north west towards Bar Hill, getting familiar with the A14 at night and then turn it around and come back to Cambridge for a few circuits and get familiar with landing it at night (remember the last time I did a night flight I’d NEVER landed a Cessna 172 – I’ve done it hundreds of times since, but this would still be the first time an instructor had ever let me land it at night). ……even when you have your license, the first times can just keep coming. Clear Skies – amazing views & almost incredible distances. 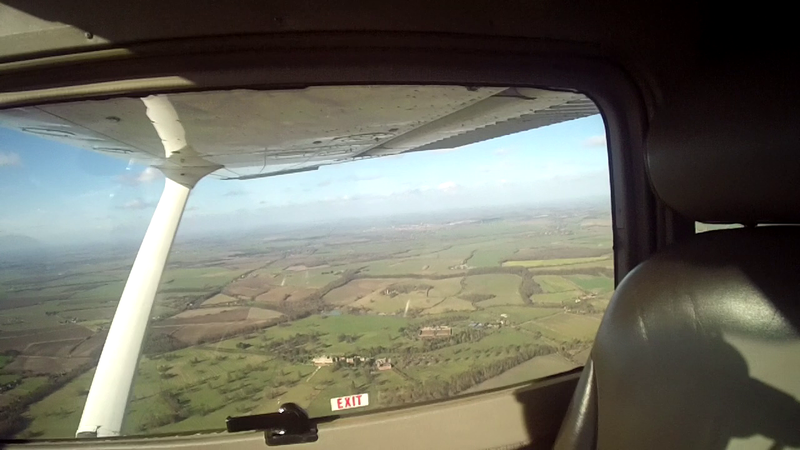 No sooner had we took off, you could immediately see Newmarket and the A14 leading the whole way. I did find myself feeling a little unsure of what I was seeing and where things were for sure. When you have the background noise of a Cessna 172 engine and you’re so used to seeing the day time landmarks etc. It suddenly is a bit weird for example to not be able to see the wind farms to the east of Cambridge, but instead be able to see the bright lights of Newmarket & the runways of Mildenhall / Lakenheath. Heading back to Cambridge Airport we were cleared for a zone transmit, not above 2,500ft, as they had a fast jet coming in at 3,000ft. 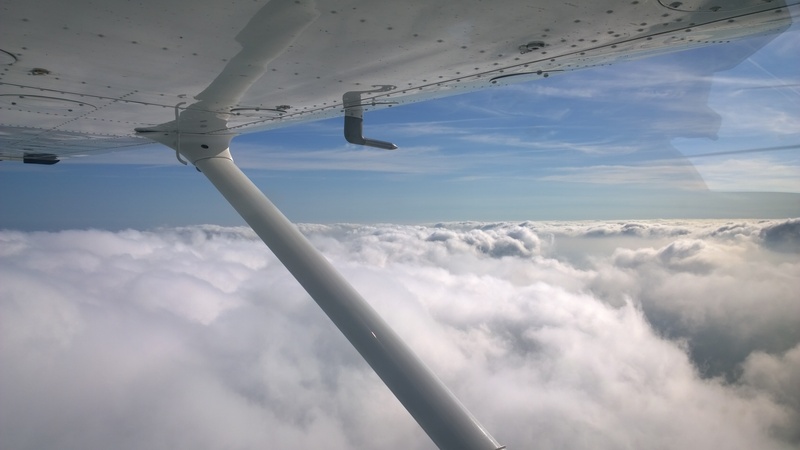 Suddenly 2,500ft ceiling sounded very wise, the last thing we need is to go arguing with a fast jet – the approach speeds of a light aircraft flying at 115+ MPH and a fast jet doing 250+ MPH alone will make your mind boggle. There is a big transmitter mast near Sandy, in the day it’s quite impressive to fly past (and will make you think twice about any low flying ideas you might have!). 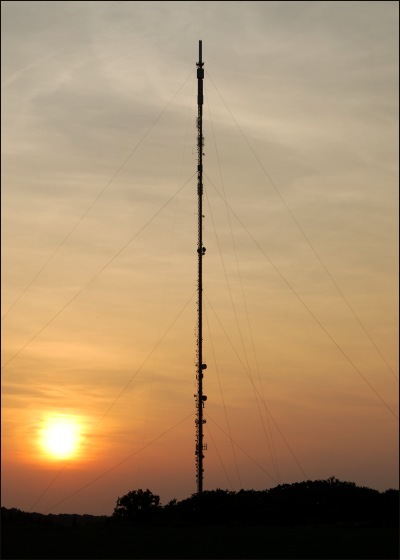 Normally you cannot see this mast until you’re within a few miles of it. However, at night because it’s over 300ft above ground level, it is lit by a red beacon light. This makes it visible from Cambridge! (20 miles away). Heading north to Bar Hill we could hear on the radio that another club student, also getting their night rating, clearly had an instructor on-board who liked the idea of the route we were doing and was copying us. Normally you wouldn’t know, but they also had to get a zone transit to follow us. On the way out I got some top tips on just how dark the dark parts of the world were and a reminder on the idea of trying to land at an unlit runway was just going to be impossible. You can really see why, from 2,000ft you just have black and bright light. Who knows what is in the black parts – sure it could be a field, it could also be a house with its lights turned out! 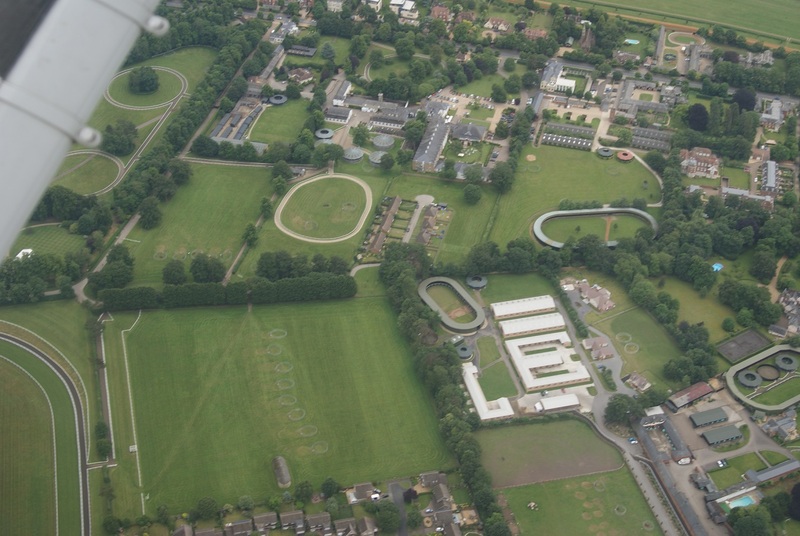 The plan was to come back to Cambridge and do a couple of circuits. 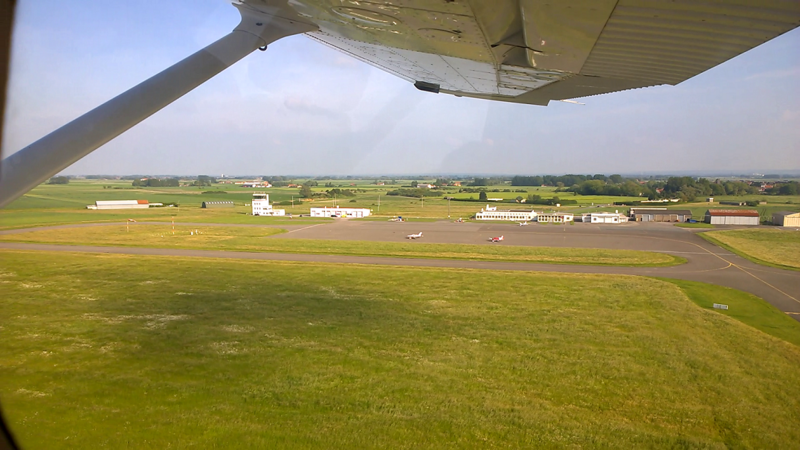 We joined the circuit and followed a PA-28, which rather tediously seemed to then go and do the worlds largest circuit! 🙁 As we were number two I had to entertain trying to follow them round, they were so wide that their base leg was pretty epic and to try and give them some time on final I told my instructor I was deliberately going to extend the downwind leg. As I turned onto final, I was pretty pleased with how well my separation plans had worked out. There was no reason they wouldn’t be able to land and taxi clear and then we could get clearance for our touch and go. What could go wrong? Cambridge Tower: We’ve had an Engine Failure on the runway. You’ve what!?!? On the what?!? How the what? 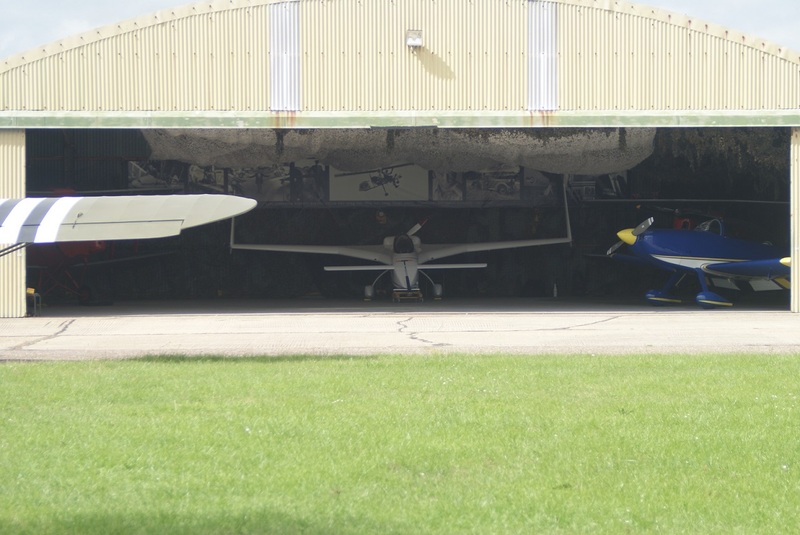 It was followed by an immediate call to go around from ATC, the training drilled into me, kept me going here – but my brain was still racing to figure out what had happened to the PA-28. They were landing, in fact they HAD landed! So how had they had an engine failure? Is that even possible? Like I said, you can have first times – even after you have your license. Whatever the cause, they were stressing air traffic control out, you can understand why. 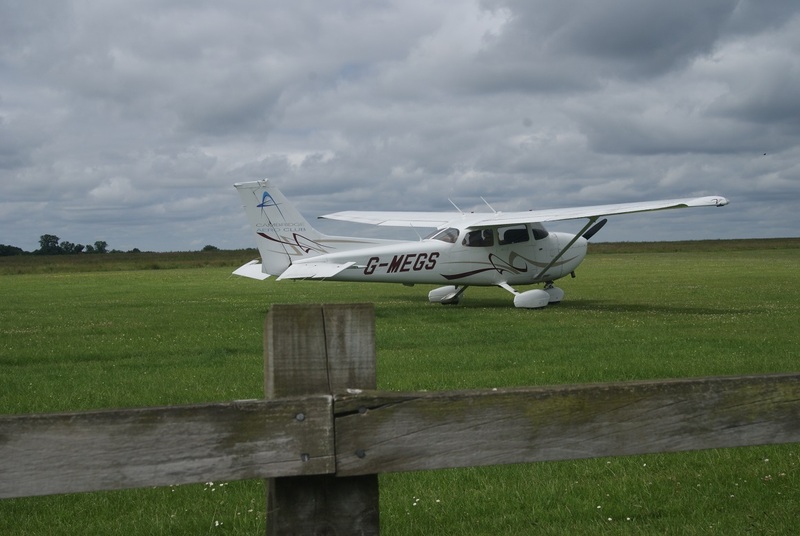 They now had their only runway blocked by a plane, with two Cessna’s destined for Cambridge in the local area and a fast jet a few miles out. 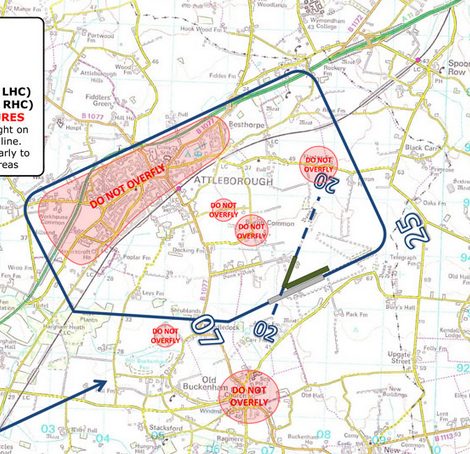 Now this is a fully fledged & night licensed airport, so they can shift a plane – but having to, while managing a load of other circling planes isn’t going to improve their day. Best theory in our plane was that they’d landed, brought the throttles back to idle and the PA-28’s idle setting had been set too low and this had just let the engine stall. I don’t mean to sound grumpy about it, but their little antic on the runway cost me a touch-n-go, so I would have rather they not have had the issue. Sometimes these things can’t be helped though and one day it might be me having the awkward moment, so I try to sympathize. Got a nice approach, brought the Cessna 172 down over the threshold and touched down just past the numbers so I was pretty pleased with the landing. Still a bit unfamiliar with the lights leading off to the taxiway, it’s one thing to know the theory, it’s another getting real experience, so a few words of advice for where to turn off and some local knowledge that ATC wouldn’t ever ask me taxi past Charlie as Delta isn’t lit. Nothing significant to be said in the debrief, think all in all the instructor was generally happy with my flying. Next lesson would focus on landing the plane with various failures, both at the airport and within the plane. The general scheme for this course is 1 hour revision, 1 hour land-away and finally an afternoon of land-aways. Part #2 got scrapped due to weather, but thankfully the instructor said we could progress to the final part, do the afternoon of challenging farm strips and if I had no issues with them, he’d consider it a done deal and I’d be free to go fly farm strips on my own. Time to impress then! The weather was looking great, so no excuses. 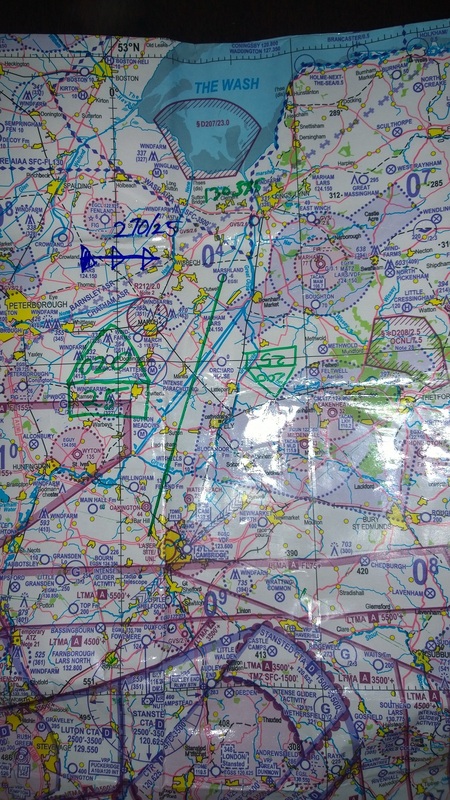 No PLOG for this trip, everything on the map again, general plan of attack was to fly up to White Fen farm (not even on the chart!) for a full stop landing, but we wouldn’t get out, then up to Sempringam Fen Farm for a touch and go and a full stop landing. What makes farm strip flying interesting to me is if you crack open the C172 SP Pilot Operating Handbook a little bit of math will tell you that the plane won’t stop at full weight and zero wind in anything under ~580m. So you can count these places out if you plan to tank up and take the family, to get into them less fuel is good and fewer passengers, even better. Because this blog post is much delayed, I can tell you that farm strips aren’t always easy to find even with the advances of Google Earth. Even now I find it essentially impossible to pin point you to where this place is. Probably a good thing. With about 2 nautical miles to run I finally spotted the place from the air. East Anglia is flat and a shade of green/yellow almost everywhere that isn’t a town. So spotting ~500m of straight grass amongst a sea of grass is harder then it sounds! 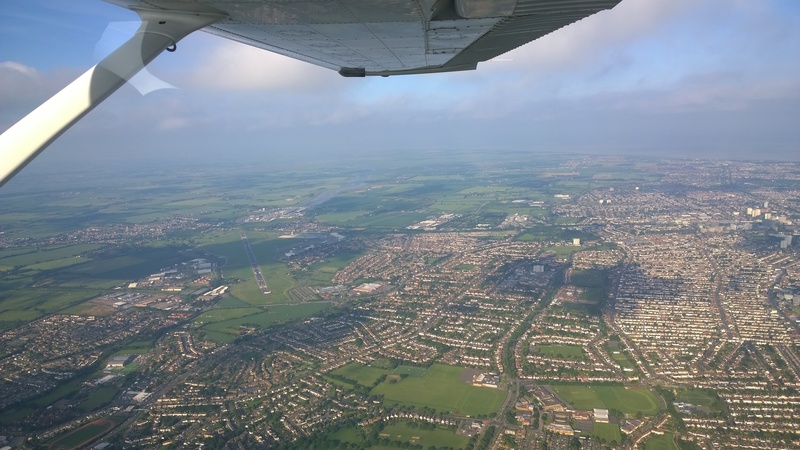 That said, I can think back to when I first started to learn to fly and instructors would ask if I could see Cambridge from 7nm out, forget it! Today I’m so used to the shapes of airfields I look back wondering how I ever missed it, but experience teaches you what to look for. Making radio calls on a safety com frequency as we joined “the circuit”, to no reply, I really focused on making sure I got my downwind/pre-landing checks in and then really put the effort in to ensure a good circuit, good height and to not turn on to the base leg until I was sure I’d have enough distance on final to get it down in one go. They were kind enough to let me come and land at their farm, the last thing they need is a C172 buzzing the house on go-arounds if I could avoid it. Taking care to not come in short, but also not hit the tree on the right it was a pretty nice touch down. I think if I could do it again I’d like to have touched down maybe 50m sooner, but I was happy with my airspeed control and the landing was controlled and not slammed. Tick in a box. We taxied down to the far end and due to the light winds take-off direction was much of a muchness, so just spun it around at the other end. 10 degrees of flap for best short field performance, brakes on and throttled up to 2,000 rpm. One last check the instructor was happy, then release the brakes and charge down the grass strip. Spotting this one was probably going to be harder and worth remembering that my dead-reckoning and wind calculations were all done on the Chart with Max Drift estimations so weren’t going to be spot on. 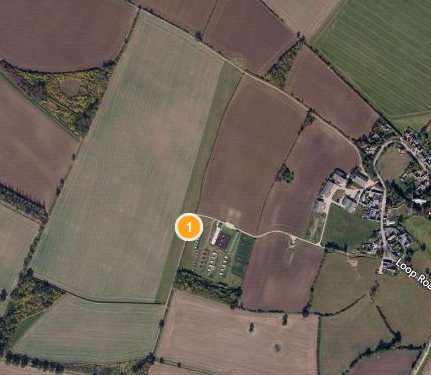 What I knew from my map was that I’d have Spalding on the right, if I overflew it I was too far right of track, if it was somewhere off to the right in the distance, I’d be to far left. 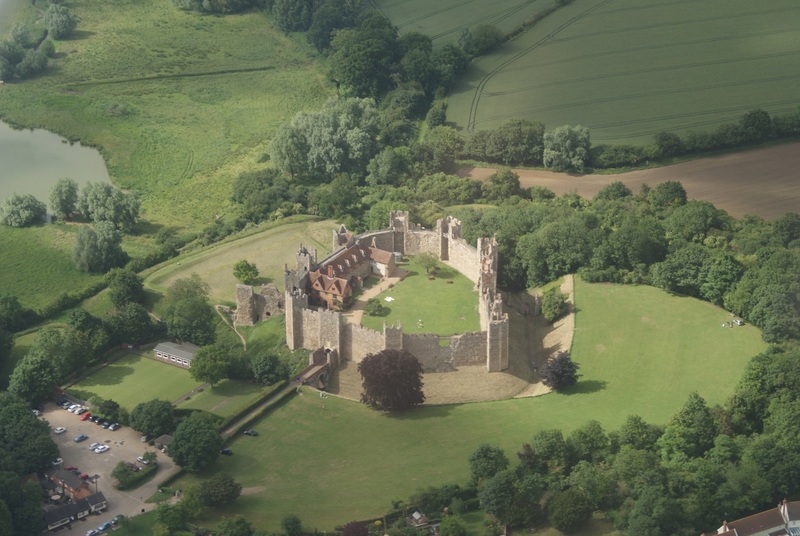 I also knew that there was a railway line that came out of Spalding and curved round to the west, if I overflew that then I’d gone too far north – I didn’t think the instructor would let that happen, but I was trying to come up with a plan to narrow down the big flat world outside. 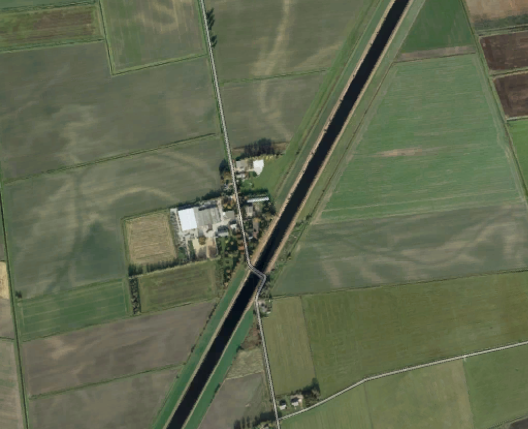 Being really optimistic I knew the route crossed South Forty Foot Drain running north/south – I was hoping I’d spot that, if I spotted the crossing for that drain, Sempringham would be on my left. Of course all best laid plans……I knew I was ball park in the right area, but ~4nm out I couldn’t see it, with hindsight I think I was a little fixated on the idea that it would be in front of me (being a bit optimistic about flying a perfect heading perhaps!). The instructor asked if I gave up and wanted him to point it out to me? Ok I give up. Pointing to the left, about 4-5 nm away was what to me at the time looked like the thinnest strip of grass ever. You’re joking that’s an airfield right? 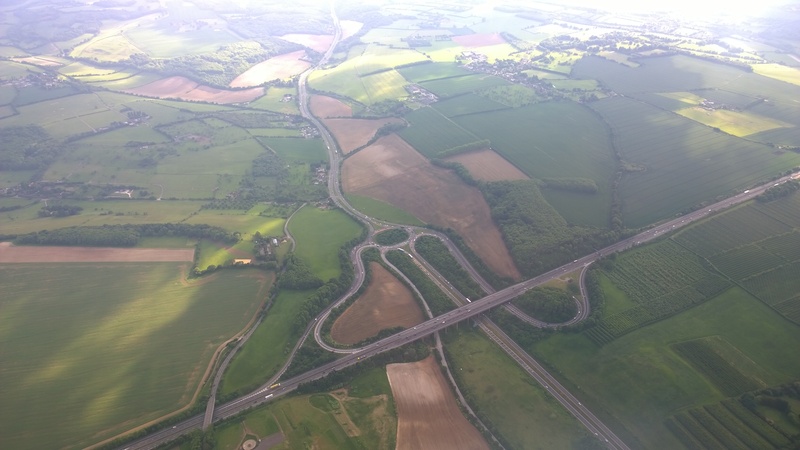 It was straight and with a house & barn at the end it was the right sort of shape, but as we got closer, from 2,000ft it still looked incredibly narrow – even if we forget the length! Impress or fail, we’d have our answer in a few minutes. Setting up the circuit, I saw a good north/south ditch type thing to the east of the strip that I decided to use as a reference for the base leg. I didn’t want to fly a silly sized circuit, but I didn’t want to turn and find myself halfway down the grass strip at 600ft either, this ditch seemed like a good sized compromise to a reasonable circuit shape. On approach my eyes and brain were working overdrive on airspeed and watching the window. Window, Airspeed, Window, Airspeed. 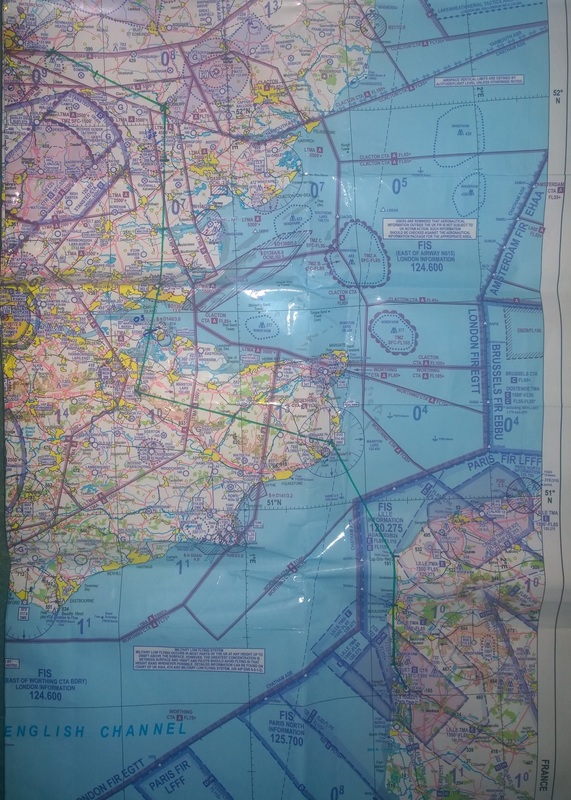 I took one comment from the instructor to just keep my airspeed up a little as I went through 60 knots – wind consideration here is critical, light winds need as much consideration as gusting etc. Even so, I was really trying my hardest to put this plane down right at the very start of the strip. Just going through 50ft the plane sank, I jumped on it and applied a little throttle to counter, caught it beautifully and it corrected just nicely enough to be able to take it back off again and touch down only feet from the start of the runway. I couldn’t have been happier with it. Full power, tons of runway left, which is saying something as it’s only 460m end to end! Another circuit and again I really wanted a spot on landing for the full stop, just to show it was no fluke. 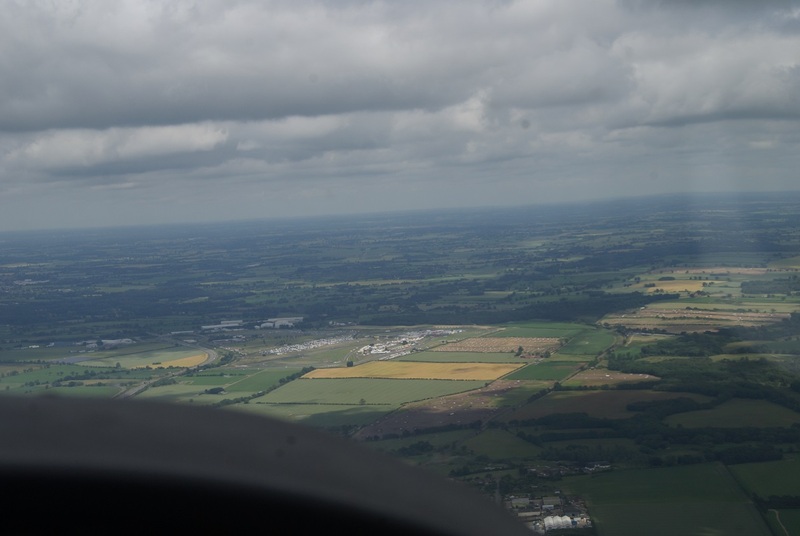 I used the same circuit points as before, they seemed to work out nicely and again went for ensuring I was totally in control of my airspeed on the approach with a constant picture out of the window. Pointing the plane at just a few feet before the start of the strip for where I wanted the plane to go and using the throttle to keep the airspeed in check – I was still getting the hang of point and power technique, but having done only a few landings using it, I can assure you that post learning, it’s really the way to do it if you want accuracy. Touch down, nice and soft and right where I wanted it to go at the beginning of the runway, we were down to taxi speed with around half the strip to go. I chalk this one up as probably the best landing I’ve ever done. Another short field take off and it was off for a really quite pleasant flight back to Cambridge, funny really that some months ago Spalding/Cambridge was a route on one of my first solo Nav’s and I must have concentrated soooo hard to not miss Spalding. 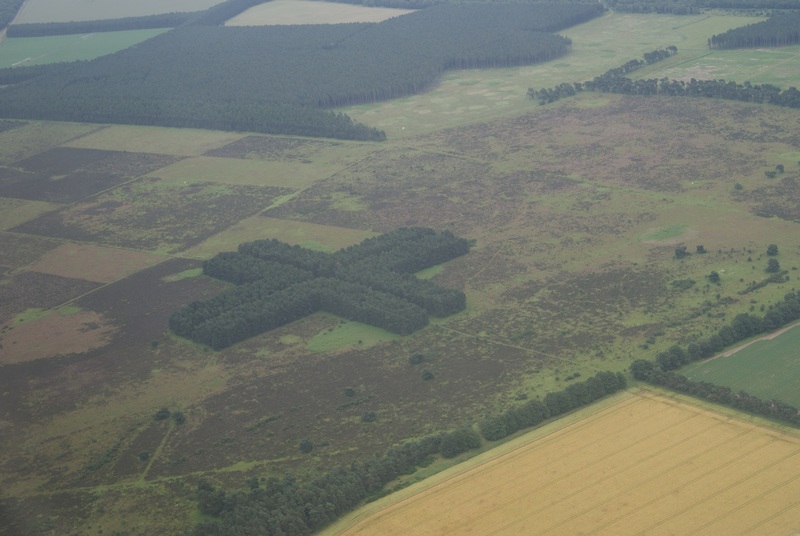 Now I was just glancing at the map, spotting the land marks and really flying with my eyes out of the window just enjoying the views and a casual chat on the way home. Great day to be flying. Back on the ground at Cambridge the chief flying instructor said he was happy with my flying and didn’t need to see any more. 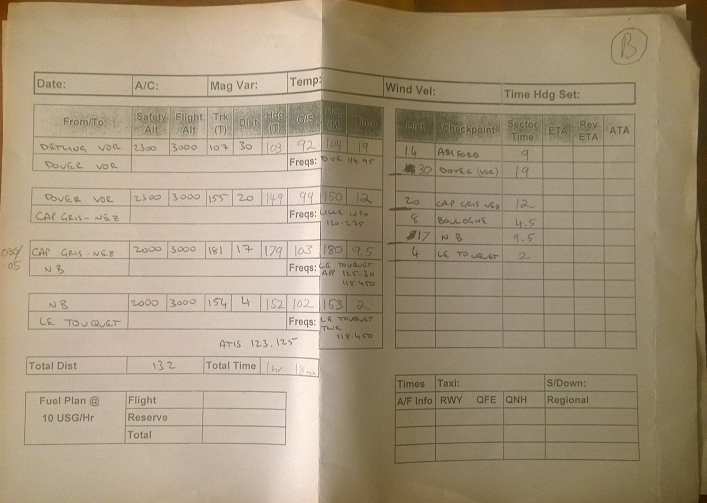 My training record now shows I’m cleared to fly the club aeroplanes into farm strips! Farm Strips: I’m hooked, more! It’s been one of the best courses, different to when you’re trying to be formally taught how to fly. Yet challenging and I really feel I expanded by skill set from doing it. Not just in terms of flying, but also increasing my confidence to try find and go into shorter strips on my own, with the right training to be able to do it safely. Hand on heart, I find myself completely hooked on flying farm strips now. On arrival this looked like it was going to be a good day, but the longer you looked up, the worse the clouds became. Obviously then the answer was to stop looking up and go get on with it! All the planning on the Chart : Wiz Wheel, forget it. I’d been told not to plan this trip out to Marshland, we’d do it on the fly. 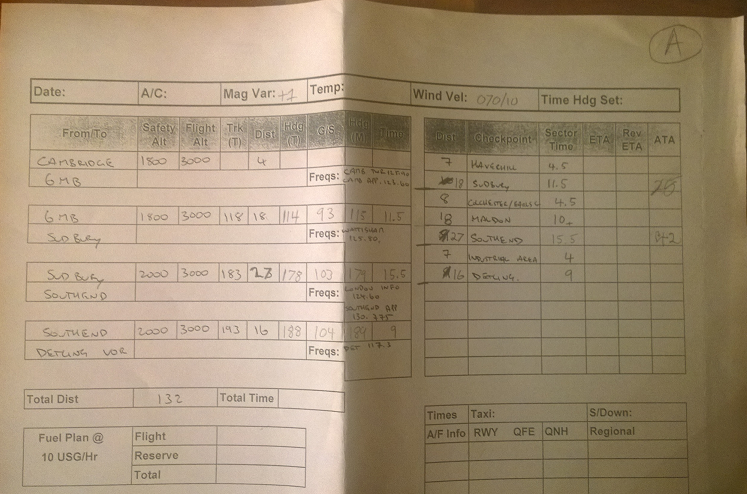 Now to learn a few more notations & symbols for drawing a PLOG on to a chart. If it’s good enough for the military to have all their planning & radio frequencies on their chart, it’s good enough for me. Normally you’d work out the wind corrections on a wiz wheel (Flight Computer), then work out heading corrections from that. Very accurate, so long as the wind forecast is accurate. However, you can’t do this easily if you’re diverting, so there’s a good case for learning to fly using Maximum Drift and some rules of thumb. Step 1 : Calculate the max drift if the wind was perpendicular to the route being flown. Math in an aeroplane is actually harder then it sounds, even for math you’d find easy on the ground. This is because you’re now traveling at ~100+mph, have people talking on the radio to you or have to listen in case they start, are trying to maintain a heading and altitude (and don’t forget to keep looking out the window!) – the constant ‘buuuuur’ of the engine also doesn’t help concentration. For a Cessna 172, with a typical indicated airspeed cruise of ~100 knots, you can optimise step 1 further by saying 60 is close to 50 and IAS (Indicated Airspeed) and TAS (True Airspeed) will be close enough at cruise speed: so 50 / 100 equals 0.5. Sure you now have a bit more error in the system, but here’s an example, lets say the Track we want to fly is 080 Degrees and the Wind is forecast to be 165/25 for our flight altitude. If we do the equations above, with TAS = 100 knots. Estimate : 25 / 2 = 12.5 degrees. So with the wind at 85 degrees to our intended track and a reasonably high wind of 25 knots, rounding up, the quick estimate is out by 2 degrees. Over a 10-20nm leg of journey, this error is going to be very negligible (i.e. 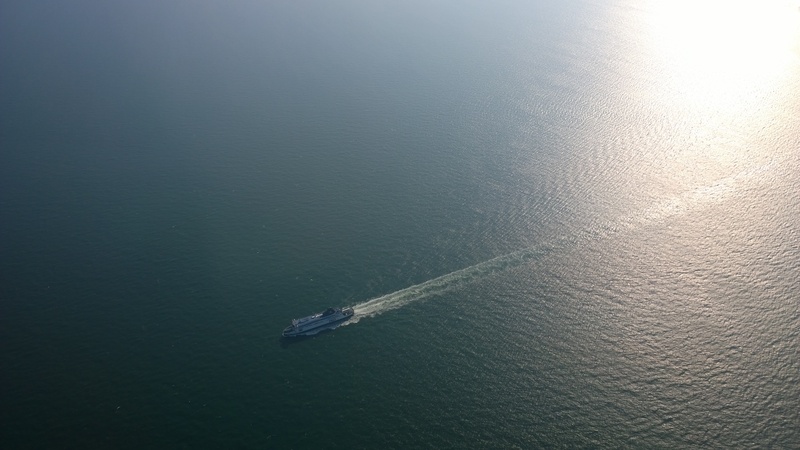 With 2 degrees error, after 60nm, you’ll be 2 nm away from where you thought, so over a typical 10-20nm leg the crude method would put you, out by 0.3 – 0.6 nm). If you still don’t like that small amount of error, remember that TAS here has been approximated to the Indicated Airspeed cruise of 100 knots. TAS will actually be higher by a few knots, at 2,000ft AMSL in a Cessna 172 with IAS of 100 knots, flaps up and in level flight TAS will be very close to 104 knots. Do the accurate math above using a calculated TAS, but use only the IAS 100 knots for the crude method and you’ll find that now the error is under 2 degrees. It’s pretty good and probably more accurate then the error and danger of going eyes down while you get a flight computer out and start remembering equations and how to do division on the thing! Step 2 : Using the clock rule system, adjust as applicable for the angle you’re flying relative to the above wind (you might be flying straight into/with the wind). 1/2 > 15 and <= 30 degrees. 3/4 if up to 45 degrees. For anything else assume Max. Drift (e.g. multiply by 1). This will give you a slightly pessimistic outcome. If Step 1 gives us a Maximum Drift of 15 Degrees, then using the details from the above (Track we want to fly is 080 Degrees and the Wind is forecast to be 165/25 ). 165 – 80 = 85 Degrees difference, so we can just assume that we’re going to get the full 15 degrees of drift. 165 – 140 = 25 Degrees Difference, so 15 * 0.5 (Multiply by a half as it’s greater than 15 Degrees, less than 30) = 7.5 Degrees of drift. If you’re still feeling bitter about my approximation method on step 1 above and have a desire for accuracy, it might be worth noting now that in the above condition with 25 degrees of difference, the drift error between the approximation and the precise calculation is less than 1 degree! Lets go flying ………even if those clouds do look a lot darker. The briefing was far shorter then your typical PPL training briefing, but even so by the time we got out to the aircraft, dark clouds on arrival, were looking lower and darker then they were before. 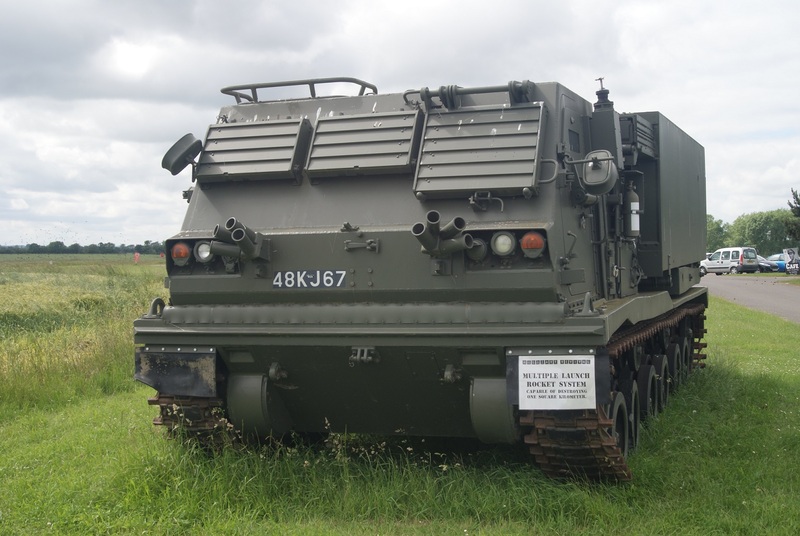 We discussed going again, was it worth it, should we go have a look anyway or not? I elected we just go have a look. In my heart I knew this was being optimistic, but the CFI wasn’t going to say yes if it was entirely pointless or unsafe and even if we just went up, turned round and came back, it would still be valuable experience of the weather with the proper instruction available etc. 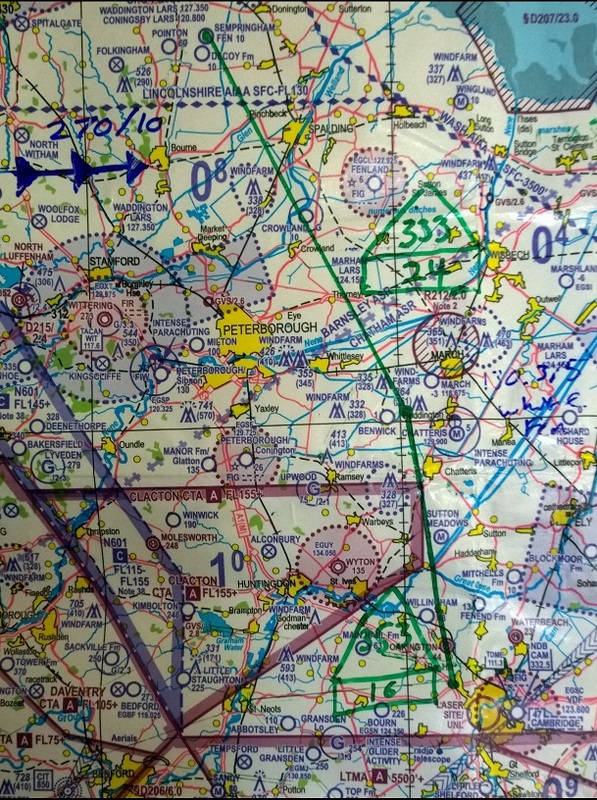 As we set heading over Point Alpha, it didn’t take very long to know we could scrap this 🙁 Already at 1,700ft and being pushed down with every minute flown, the north of Cambridge looked like a wall of darkness and cloud – maybe, just maybe, if we dropped to ~1,000ft and pushed on past Waterbeach, maybe it’d clear. The instructor asked what I wanted to do? While on the ground I was of the view that there’d still be some things I could learn by going up in less then ideal starting conditions with experienced instruction. Now I just felt this was more a question of “but should you carry on” rather than “Do you want to”. I saw no point, it was a lot of maybe’s – that might not come true and if they didn’t how bad would it be when we gave up and tried turning round? Even if they did come true, we’re aiming for a grass strip in the middle of nowhere, when we get there we’ll have no idea of the surface winds and even if we can get a rough idea of them, probably it’ll make for a hell of a challenging landing and I’ll come away from it feeling rubbish and like I’d forgotten how to land. That would add no value to this objective. I elected to call it a day and turn back for Cambridge. 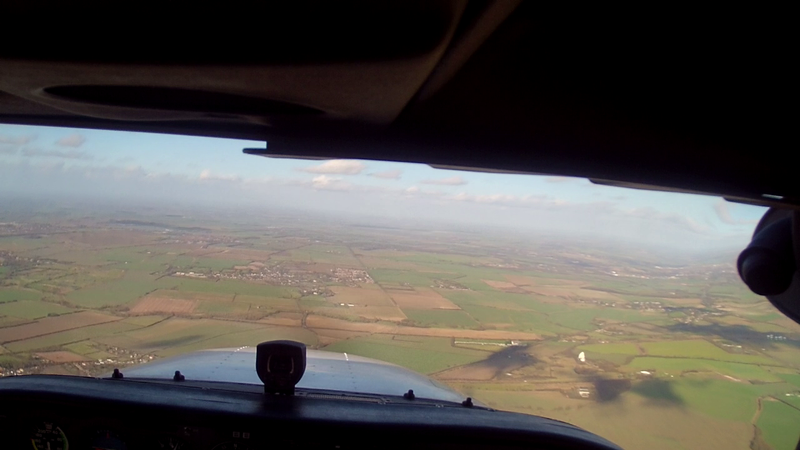 As I lined up on final approach there was a crosswind and you could feel it gusting hard on the controls. 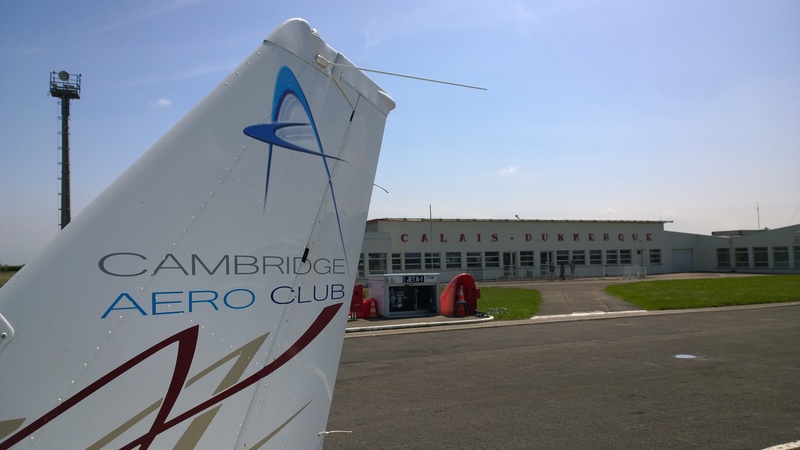 I’d had worse on the way out to Calais, where almost full opposite aileron control was required to keep a Cessna straight, but now we were trying to land and there’s a big difference between keeping it straight at 2,000ft and keeping it straight at 500ft. 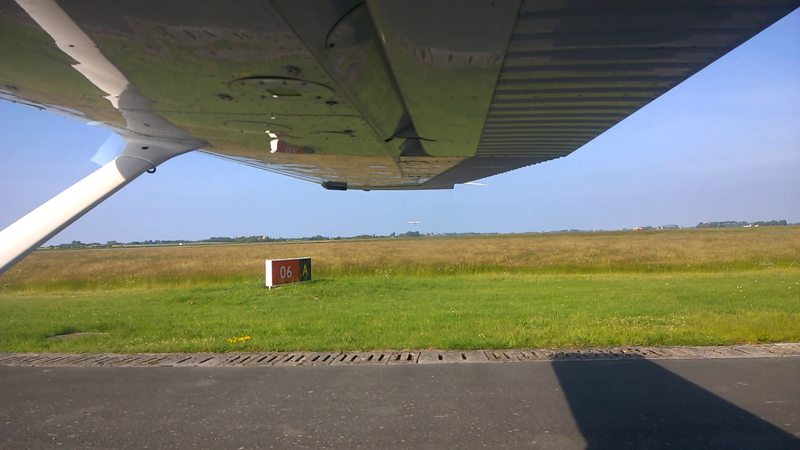 Throttle Fully open, the Cessna managed to get lift again. The window outside went from a happy picture, to the runway filling the screen in milliseconds – we’d just dropped out of the sky, for that second or two there was no flying involved, we’d just fallen straight down. It’s a moment like this that makes you appreciate being in a C172 and not something with less power. 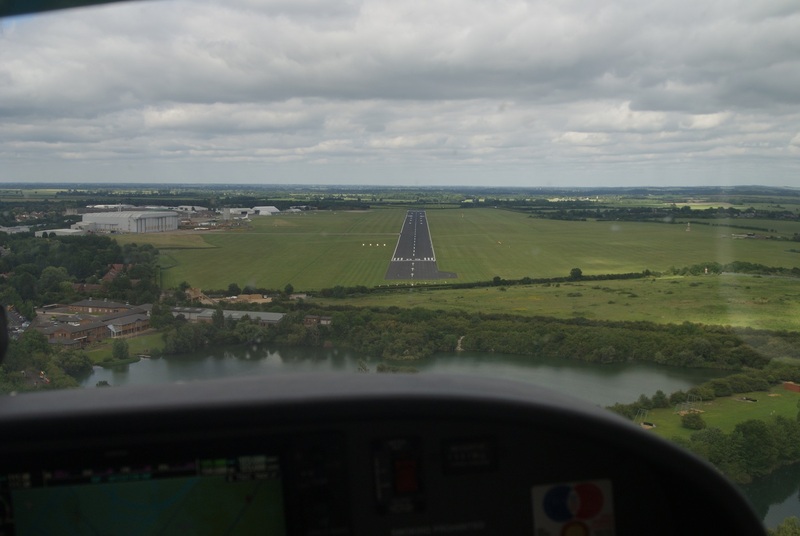 However, Cambridge is a mile long runway, so once recovered and flying again, the CFI said I could just re-land it a bit further down the runway – it meant we had to back track after landing but, still better than a full go around. Once safely back on the ground with time to reflect, the CFI said that the natural reaction of trying to pull back on the controls with only a little power would have been absolutely no good and we’d probably have just slammed the tail of the plane into the runway – he also said it was probably the worst wind shear he’d been in, I take that as meaning it was about as bad as it can get.